You’ve probably heard the big news earlier this month (or even further back): that LEGO has finally included a wheelchair in a set. It was revealed at one of the toy fairs, with numerous photos floating around. I know people have been clamouring for a LEGO-based wheelchair, with some going as far as building their own. 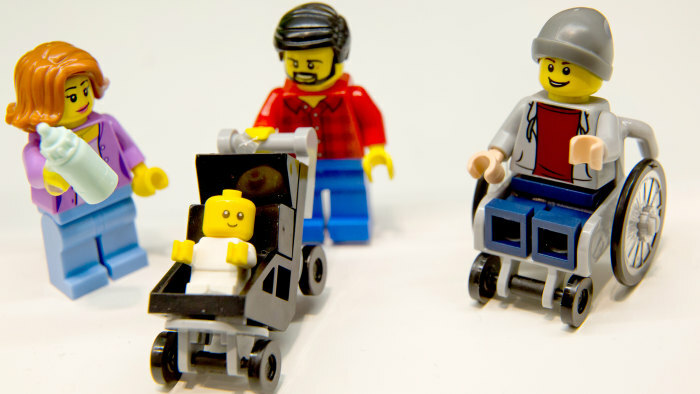 I for one like that LEGO have created a dedicated wheelchair part, which – along with the Clumsy Guy in Series 15 – suggests that more sets related to disabilities/handicaps are in the making. I had been meaning to talk about the new wheelchair part on SilentMode.tv when I first saw the pictures, but I was reminded of it yesterday when an article by Today appeared on my Facebook wall. It was the first time I’d seen there was also a baby minifigure, though I’m not sure if it’s real. As far as I can tell, the wheelchair is part of a City set to be released this year, featuring a stay at home dad and a working mum. I’m not sure how anyone was able to tell the situation just by looking at the minifigures, but that’s what I have to go on. I don’t want to turn this post into another rant, but hopefully you’ll [now] see that my points made in yesterday’s post are relevant. While it’s great that LEGO’s official stance is that they’re not caving into pressure, I wouldn’t be surprised if moves are being made, probably calling for an official set celebrating single mums or something. If that happens, the rabbit hole can only go deeper… As one person commenting on the Today article correctly pointed out, various other groups would be forming a queue to demand representation. As for the working mum and stay at home dad situation, I’m actually pleased that LEGO has placed an emphasis on families. Here in the UK and other western countries, the family unit is becoming extinct, regardless of whom is at fault. There’s also the theme of people pulling together to enhance others’ lives and wellbeing (the working and disability situations), which I also see as becoming extinct with the prevalent “me, me, me, I am God” mentality.